Fruit kabobs are your ticket to becoming a backyard-barbecue legend. You volunteer to bring one of the easiest possible dishes to your friends’ picnic: fruit. Yet when you arrive, fruit plate in hand, the adults are wowed. The kids are delighted and immediately begin scarfing fruit instead of chips and mini cupcakes. You are a hero. When we posted our Healthy Sugared-Vanilla Yogurt Fruit Dip, our photos included some fun fruit kabobs and decorative fruit cut-outs. It wasn’t just all for show, though. 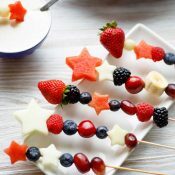 When we took our fruit dip to our Fourth of July parties the following weekend, we really did spend a few extra moments to create fruit bouquets and cut-outs. It’s so worth it! 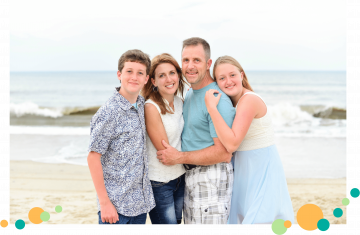 Through the years, we’ve always been surprised at how many ooohs and aaahs this simple strategy can net. We’re also consistently surprised at how many people wonder if we actually did it ourselves. Hmmmmm … something so simple that can turn humble fruit into a work of art? 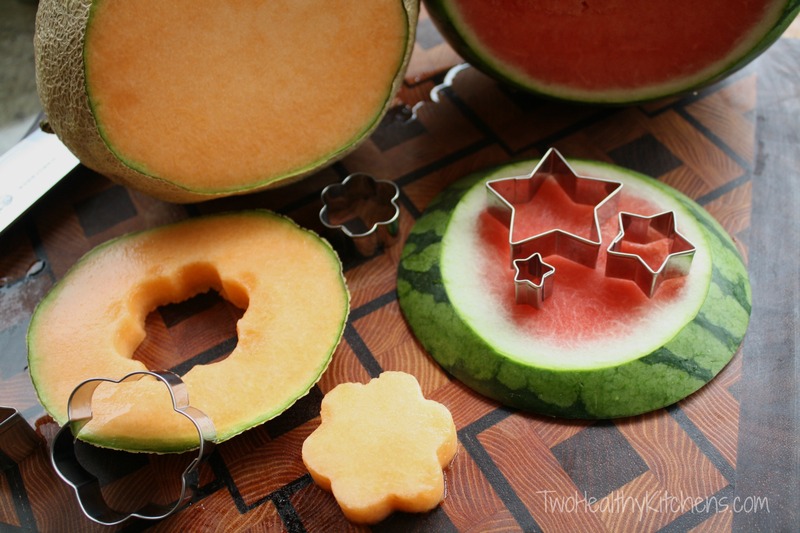 All you need are some cookie cutters in fun shapes like stars and flowers, a small vase or an apple to serve as a base, and a few of those bamboo kabob skewers you can purchase for just a buck or two at pretty much any supermarket. Oh…and fruit! For the ultimate fruit kabobs, we recommend that you buy a melon or two – watermelon, cantaloupe, honeydew – whatever looks good at the market. Actually, the easiest-ever kabobs do not require any cookie cutters or melon at all. Just thread a colorful variety of fruit onto the skewers. Done! 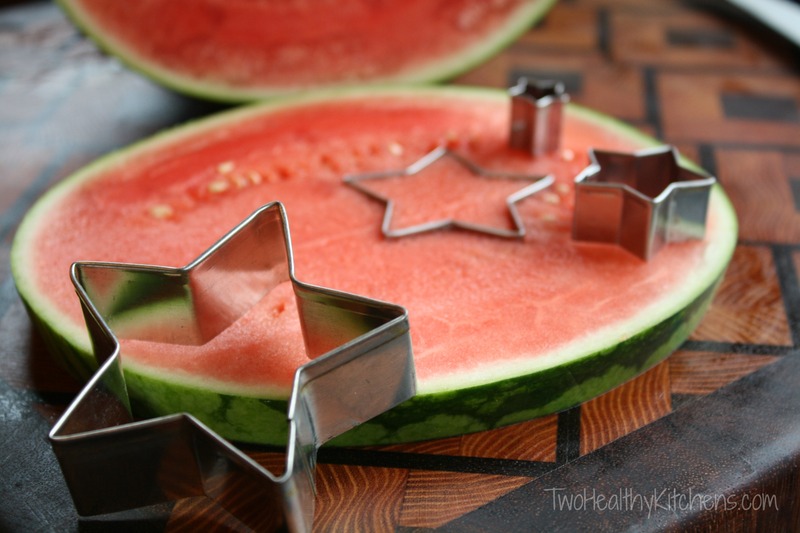 For a little extra panache, cut your melon into slices, just slightly thinner than the depth of your cookie cutters (so your cutters will easily be able to cut all the way through). 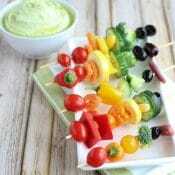 Then, cut out your fun shapes and add those to your skewers. So easy! 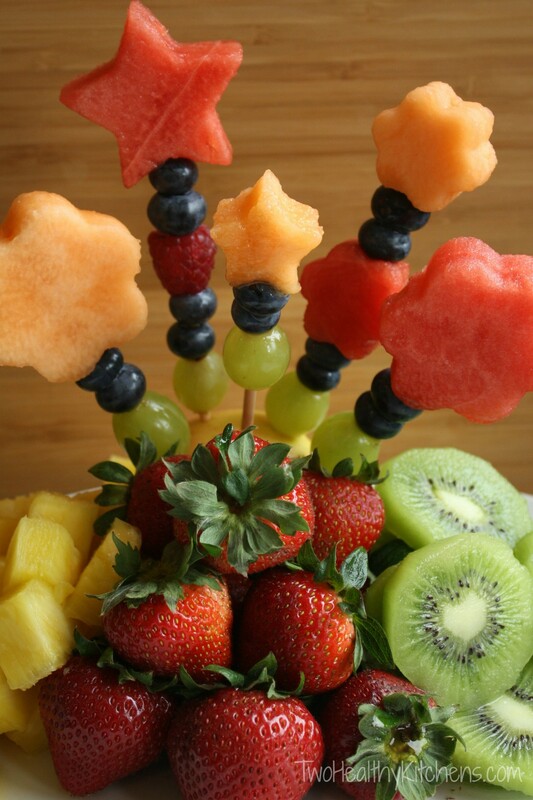 We recommend that the bottom fruit on each skewer be something sturdy like a grape. This will help to prevent the entire stack of fruit from slowly sliding its way down. Watermelon, for example, just isn’t dense enough to serve as a good base fruit (because, well, it’s mostly water …). Now, grab a small glass or a vase. Break a few of the skewers off at the bottom so that some of them are taller than others and they don’t all have the same height in the vase. Place the vase on your fruit platter, arrange your gorgeous bouquet (channeling your inner florist), and heap all of your other fruit around your pièce de résistance. Fab! Alternately, if you want a little less height, you can swap out the vase for a base like an apple (or a small head of iceberg lettuce … anything sturdy … you’re basically creating an edible base similar to florist’s foam). 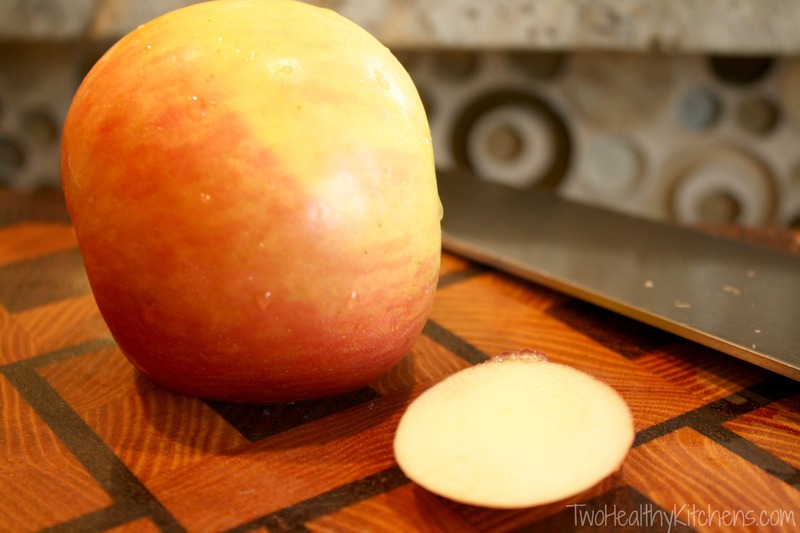 Cut the apple so that it has a flat side and place the apple, flat-side down, on your fruit platter. 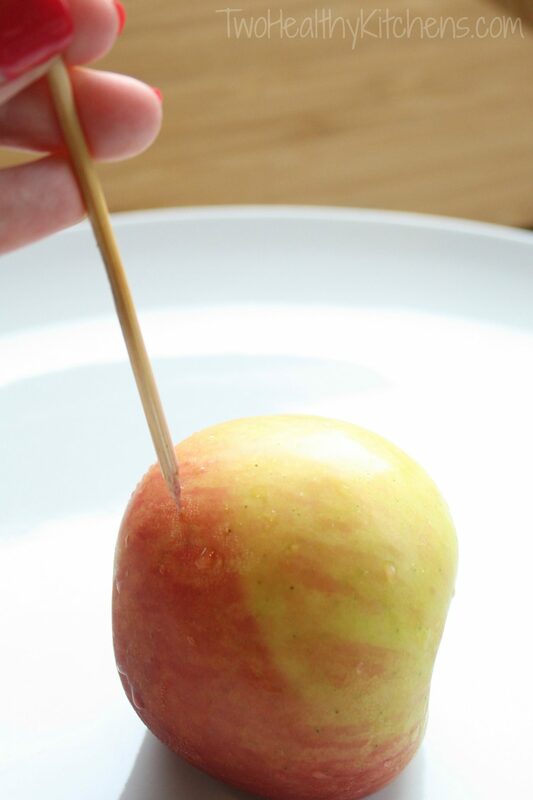 Using an empty skewer, pre-poke some holes in the apple where you want to stick your fruit kabobs. Then, place your gorgeous kabobs into the pre-poked holes, breaking the bottoms of some skewers a little so they’re at differing heights. Mound all your other fruit around the bouquet on your serving platter … and you’re done! No time to make kabobs? Couldn’t find skewers at the store? No problem! Just place a few cut-out shapes randomly on top of the other fruits on your platter. 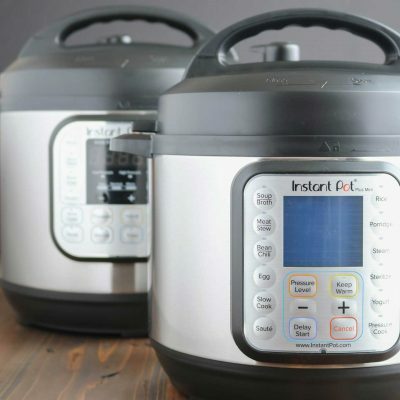 Guaranteed – they’ll be the first to go! 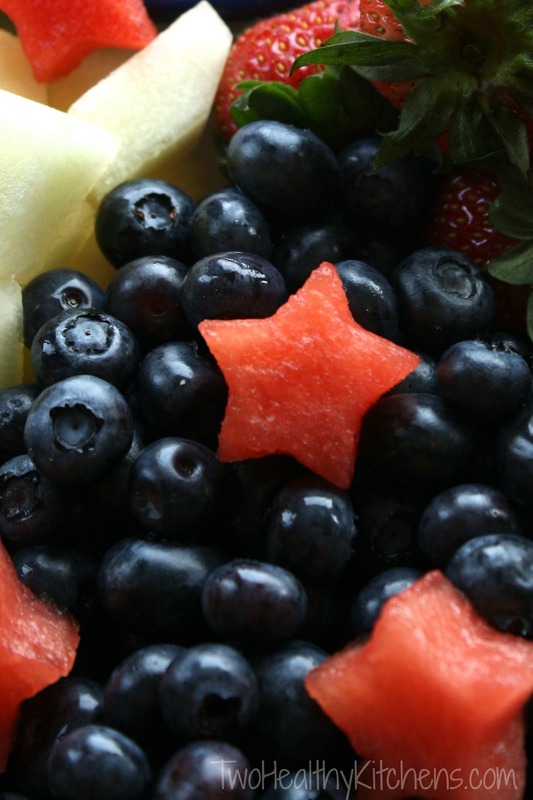 Oh – and one of the easiest ways to inspire your kids to nosh on fruit any time of the day? You guessed it! Just thread fruit onto “princess wands,” “pirate swords,” “triceratops horns” … anything that will strike their fancy! Why does food always taste better on a stick? Who knows? And, really, who cares? As long as it inspires people to gobble more healthy fruit, does it really matter?!? I love this i cant wait to make my own my sons turns 18 tomorrow. Perfect. Cool idea! 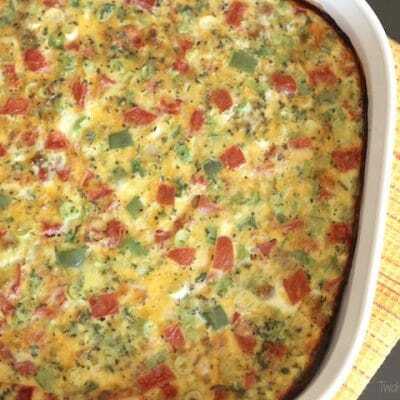 I think I’ll try this at my church potluck in June. Thank you! So simple but very useful for special occasions! Thanks for this pictorial guide! So creative and delicious arrangement. It’s fun to make it. Thanks for share your ideas. These are so expensive! 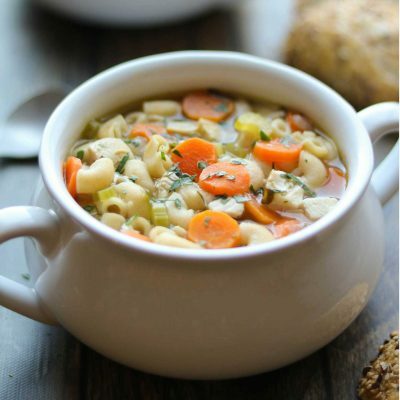 Thanks for sharing a way these could be made at home inexpensively! I was looking at your chili recipe and I spied this over on the side. What a great post. I love the fruit arrangements and I’ve bookmarked it for the future. Thank you so much for sharing this. It is easy, looks great and definitely can’t wait to try it out for my daughters 2nd birthday this Saturday. Aww, Elizabeth! What a special party!! Happy, Happy 2nd Birthday to your sweet girl! 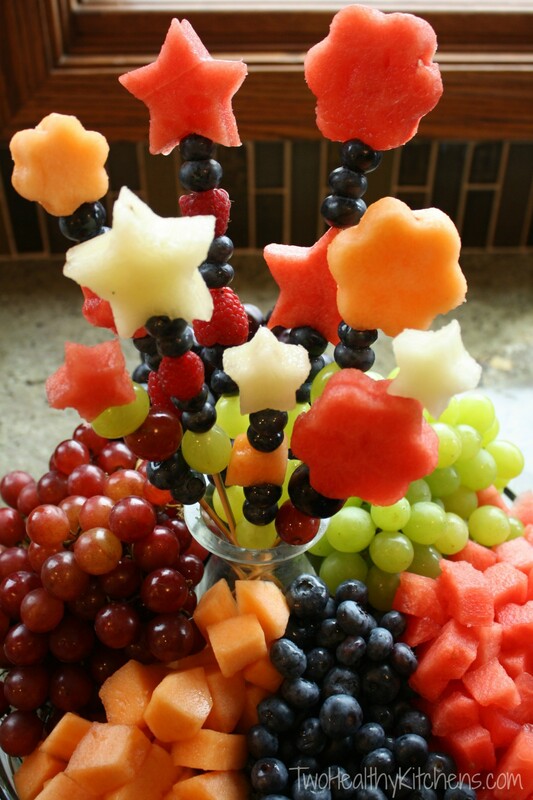 My heart and star shaped fruit kabobs were a success! 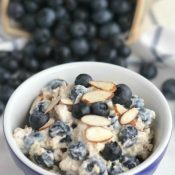 Everyone loved the display and they also loved your easy to make fruit dip. 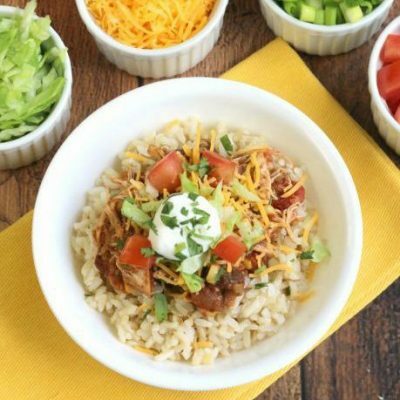 Thank you again for all of the easy and delicious recipes! I loved this idea! It looks as though the star and flower at the top are doubles. Did you press two cutouts together? how do you hold them together on the skewer? Go in at a little bit of an angle to catch both? Can’t wait to try this, it’s really cute! 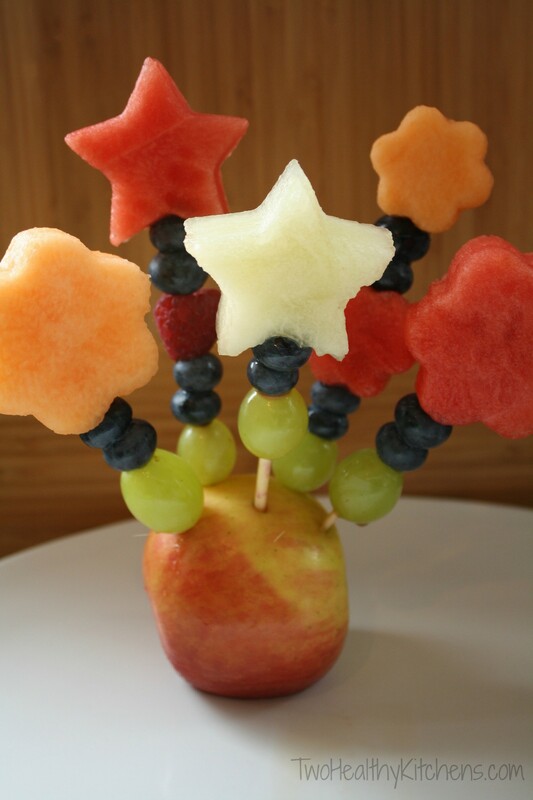 The star and the flower are just one piece of fruit each. 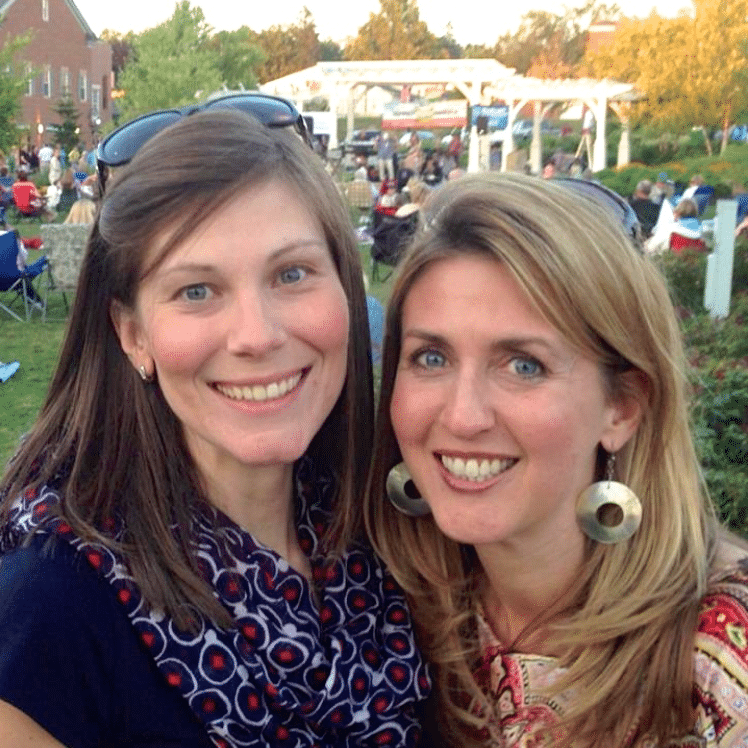 We can see why you’d think that – the angle that the photo was taken at does look like there are two together! Sorry for the misleading photo! Actually, if you wanted to try a ‘double,’ you could look for nesting cookie cutters. Then, for example, you could cut a large flower shape of watermelon, and a smaller flower shape of cantaloupe, then press them together, so the cantaloupe is inside the watermelon. Our favorite part? 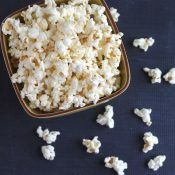 The kids are so happy with these as dessert or a snack (they make awesome treats for the soccer team, too!) and we don’t mind them having seconds! It is because you took the time to do it! You are the perfect guest! What fun!